Ham: The Kentucky Horse Park in Lexington, Kentucky, (an hour south of the Creation Museum) is—from what I hear—a very good tourist attraction. Opened in 1978, the park takes up 1,229 acres and is home to around 115 horses. Many people who come to visit our Creation Museum make the drive to visit the Kentucky Horse Park as well. Unfortunately, however, even though the park has many great attractions, it also promotes (outdated) evolutionary ideas—to both adults and children. As opposed to Mr. Ham’s “museum” which promotes a sectarian interpretation of the Hebrew creation myth, written down (in its current form) around the 6th century B.C.E., as cutting edge science. But never mind that. Ham: Many of us will remember seeing the supposed “horse evolution” series in our textbooks many years ago. However, this idea has been basically thrown out—even by many secularists. It is simply not true. The flaws have been exposed many times, but sadly, that doesn’t always stop some museums and science textbooks from regurgitating this old idea. The only thing that has been “thrown out” regarding the evolution of the horse—or any other organism—was the idea of anagenesis as the primary mode of evolutionary change. Anagenesis is the hypothesis that all the members of a parent species simultaneously evolve into a daughter species which would tend to cause lineages to evolve in a linear, or ladder like fashion, with each successive species representing a higher rung in a ladder of progression. The more extreme form of this idea is orthogenesis wherein certain lineages progress in definite directions as if they were preordained. And while this concept is still sometimes inadvertently conveyed in popular illustrations and museum displays, it was generally abandoned by paleontologists and evolutionary biologists in the 1950’s. From McFadden (2005), p. 1729. 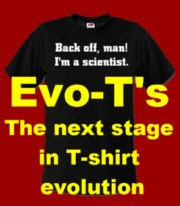 Unfortunately despite the efforts of scientists and educators the idea of anagenesis still dominates popular thinking about how evolutionary changes occur (especially amongst creationists). Ham: Surprisingly, the Kentucky Horse Park still promotes this false idea. If Mr. Ham’s were merely claiming that the Park’s displays convey the misleading anagenetic view of horse evolution, then his criticism would, though perhaps a bit pedantic, be valid. I doubt however that is his meaning. Rather it seems clear that he is attempting to convince his readers that the fossil evidence for horse evolution has somehow been discredited and thrown out entirely. If so, it is Mr. Ham not the Park that is promoting a “false idea”. Ham: It has a display called “Evolution of the Horse,” which uses a mural on the wall of the Kid’s Barn to teach children about horse evolution. It begins by claiming that the horse Eohippus (sometimes called Hyracotherium) lived 60 millions years ago, and was the horse Equus’ (what we would recognize today as a modern horse) earliest ancestor. I guess it’s my turn to be pedantic. Hyracotherium, barring a shift in scientific opinion—which may be in the works—is sometimes called eohippus, not the other way around. This is due to the rules of zoological nomenclature wherein the generic name for an organism—living or fossil—that is published in the scientific literature first gets priority. The name Hyracotherium was published prior to eohippus and later when the fossils these names were given to were reevaluated and decided to be similar enough to be placed in the same genus, the name eohippus was subsumed into Hyracotherium. Though as I indicated this might be changing again. Ham: However, Robert Owen, the discoverer of this species, named the original specimen Hyracotherium because it resembled a rabbit-like creature. So this supposed evolutionary ancestor of the horse was not a horse at all! Here we go! Once again regular readers of this blog are forced to endure the repetition of these facts but come hell or high water, every time they repeat the lie I am going to correct it. Did Owen, at that time, consider it the ancestor of later horses? No, but he only had a partial, crushed skull to work with. Not to mention all the other fossils intermediate between Hyracotherium and modern Equus which had not yet been discovered. So why would his inability to see that Hyracotherium has a relationship to later horses carry any special significance? Ham: The display at the Kentucky Horse Park walks visitors through the evolution of the horse, stopping next at Mesohippus. One popular belief in regard to the horse evolution series is that as horses supposedly evolved, they got bigger. Eohippus is listed as 14 inches tall, while Mesohippus is listed as 24 inches tall. The next two horses in the display, Miohippus and Merychippus, grow steadily bigger. It is not a “belief” that there was a trend towards larger sizes among certain equids; it is simply an observation of the fossil evidence. Ham: What’s the problem, though, with the belief that horses somehow evolved into larger and larger animals? If that were true, shouldn’t we see only very large horses today? But we don’t—horses vary in size from the Clydesdale to the much smaller Fallabella (just 17 inches tall). As to whether we should only see large horses today, this would only be true if we were to insist that a trend in one lineage had to be matched by all lineages, however there is no biological reason to do so. Also by Mr. Ham’s reasoning one could argue that populations of humans known as pygmies may not have descended from a common ancestor with other, taller, human populations. Surely Mr. Ham doesn’t believe that? As for the existence of miniature horses, I fail to see how the fact that humans have created, through selective breeding, a few breeds of horses that are smaller than wild types of Equus, is somehow a mark against the evidence for the evolution of the horse. Ham: All the horses to this point in their exhibit have three-toed hooves. Well, Hyracotherium had three on the back foot and four on the front, but then Mr. Ham doesn’t believe it’s a horse so I guess we can let that pass. Ham: But shortly before visitors reach the end of the display, they see the horse Pliohippus, which is claimed to have existed 10 million years ago. The horse Pliohippus had some controversy surrounding it. Evolutionists have tried to say that Pliohippus was supposedly evidence of a transition from three toes to one toe in the evolutionary process. Their claim was based on the 1981 discovery of two fossilized hooves found together in a volcanic eruption, both from Pliohippus. But what does this discovery really prove? That three-toed and one-toed horses existed at the same time! What an odd statement. It is additional evidence—not proof, science doesn’t deal in proof—that modern single toed equids descend from ancestors that had multiple toes. You know, evolution. Further evidence is the fact that living horses are occasionally born with atavistic toes. 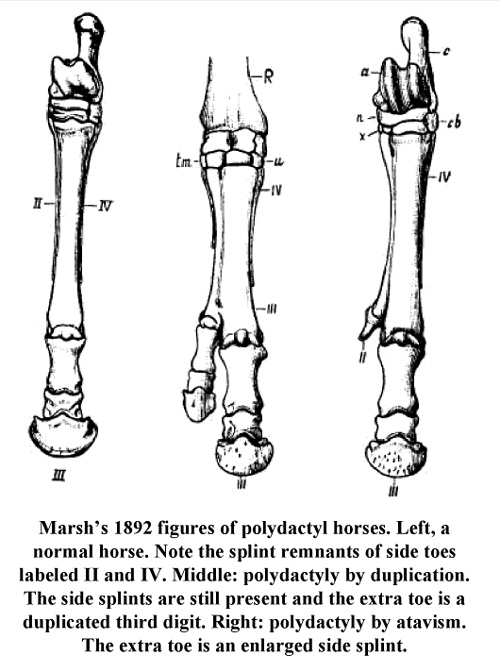 I don’t know why Mr. Ham would make an issue of this given that many YEC accept that living single toed horses are related to fossil multi-toed ones. In other words, according to these YEC, all the fossil horses that Mr. Ham finds so objectionable, including Hyracotherium, are all one “kind”. Why doesn’t Mr. Ham go argue with them about how “Robert Owen” thought Hyracotherium was a hyrax? Moreover Ham even has a picture of a hypothetical “Ark equid” (which I presume is the supposed ancestor of all living horses that survived the Noachian Flood in the Ark) in his museum, which from the—admittedly low resolution—copy I have looks like it has multiple toes! Ham: This children’s display ends with Equus, which evolutionists will claim emerged 4 million years ago. The adult version of the display, located in the International Museum of the Horse, looks a lot like the Kid’s Barn display—except the adults see fossil displays instead of paintings. It’s sad to see that the Kentucky Horse Park has not only compromised with millions of years and the idea of evolution, but it’s also teaching a disproved idea to children and adults. And there goes another irony meter! A man who believes that humans lived with dinosaurs like in the Flintstones, who doesn’t even know the name of the long dead scientist whose authority he is appealing to and who has dedicated his life to spreading half-truths and misinformation, is lamenting the fact that scientific evidence is being presented. Nice. 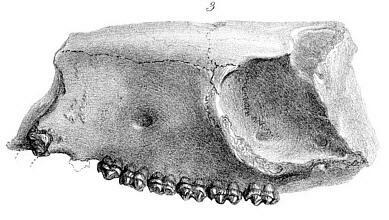 Yes, in that article the author (Hastie, 1995) claims that Richard Owen thought that the Hyracotherium skull he was describing looked like a “fox’s head” rather than being “rabbit-like“. Which is it Mr. Ham? Except that vertebrates vary in the number of ribs they have even with a species! For example humans normally have 12 pared ribs, however occasionally individuals are born with 11 or even 13 pairs. Likewise in modern horses we find that they can have 17, 18 or 19 pairs of ribs. Clearly, if individuals within a species can vary in how many ribs they have, the fact that they vary between fossil species cannot be used as evidence against a descent relationship between them. Ham: Also, you can read Dr. John Morris’s book The Fossil Record, which also discusses horse evolution. ‘O Oysters, come and walk with us! I think the fact that creationists like Ham keep on spreading misinformation like this, as well as their studied refusal to understand even the basics of evolutionary theory speaks volumes about their intellectual honesty. Furthermore I find the fact that he makes a living inflicting this upon children quite offensive. McFadden, Bruce J. 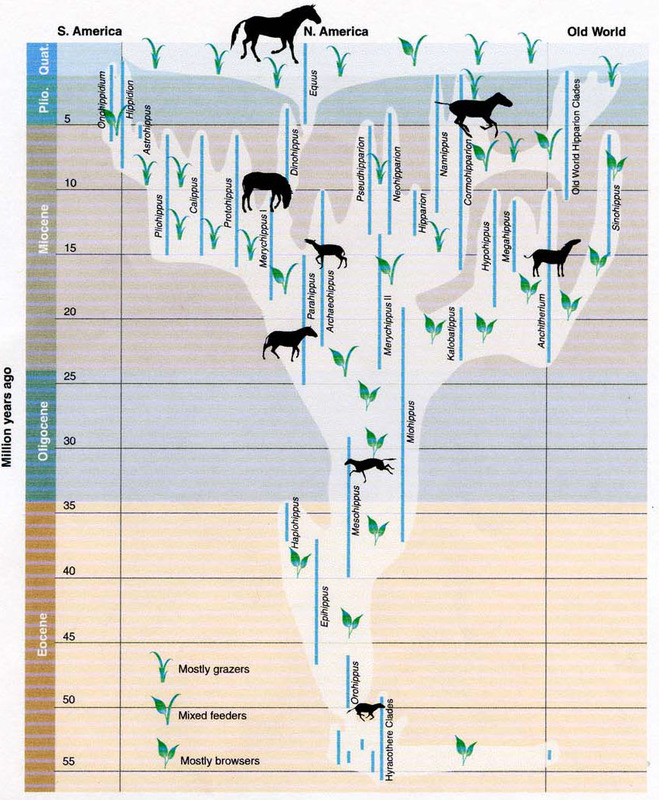 (2005) “Fossil horses — evidence for evolution”, Science, 307:1728-1730. * This quote of Huxley is generally considered to be apocryphal and did not enter into the accounts of the Huxley/Wilberforce debate until decades after the event. But it is a great story. ** Many paleontologists consider Hyracotherium to be paraphyletic which would mean that some fossil currently classified as Hyracotherium could be ancestral to later horses (and thus members of the Family Equidae) while other are perhaps ancestral to other members of the Order Perissodactyla. See my post Epic Horse Exhaust for more on this. 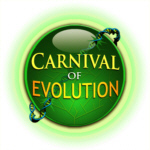 This entry was posted in Antievolution, Comparative anatomy, Creationism, Defending evolution, Evolution, Geology, History of Science, Paleontology, Science, Systematics and tagged Answers in Genesis, Around the World with Ken Ham, equids, Equus, fossils, horses, Hyracotherium, Ken Ham, Kentucky Horse Park, Paleontology. Bookmark the permalink. ← Is that what it takes? I think that Hyracotherium as the most basal equid has been convincingly rejected by Froelich in his 2002 monograph in the Zoological Journal of the Linneain Society (vol. 134, pp. 141-256). He indicates that the genus is a basal Equoid, outside of the true Equids, and is more closely aligned with the extinct Palaeotheriids. So Eohippus is resurrected as a valid genus, and joined by a number of other basal horse genera: Sifrhippus, Minippus, Arenahippus, and Xenicohippus. Thank you for an excellent post, and for fighting the good fight. Thanks! And you’re absolutely right. I talked about this in more detail in one of my earlier posts on the subject: A horse is a horse, unless of course…. I’m just being a bit conservative and waiting till I see whether or not Froehlich’s reclassification becomes generally accepted (and it may well already have been in relevant paleo. circles, it’s just I don’t yet have knowledge of that). Oh, and I how you don’t mind but I upgraded your underscores to italics. In fact, every major taxon of fossil horse is found in Nebraska. Oh — and “fossil fragments”, when we have numerous complete skulls and skeletons. Ha ha. All in Nebraska, really? I didn’t know that. In the New World, sure but not in Nebraska. Anyway, I didn’t want to go into a full rebuttal of that article as well, so I just picked a couple of things to make the point. Oh, totally — it’s just that this is lie is a particular favorite of mine. I think all of the equid genera are in the Nebraska State Museum —- perhaps not a few oddballs like Archaeohippus, but certainly all of the “regular” guys. Plus, dozens of complete skeletons of Pliohippus and Neohipparion from the Ashfall beds. What’s neat about the Pliohippus is that they actually show variation between individuals in having (in the front feet) decent side toes, reduced side toes, and no side toes. Of course, Owen wasn’t an evolutionist, so it’s not surprising that he didn’t interpret Hyracotherium lime and evolutionary biologist would. Yeah, Owen was one of those 19th century guys that is hard to place. He would argue against Darwin on the one hand but then say things that came awfully close to evolution on the other. I seem to recall hearing the suggestion that he was really just jealous of the fact that he didn’t think of natural selection etc. Though even if we take him as a full on creationist, it wasn’t of Ken Ham’s sort. Owen would have scoffed at the nonsense these people spout, as would most of the creationist scientists of his day (Buckland Sedgwick, Agassiz etc.). I know this is an older post but Ham’s claim of Falabellas being 17 inches tall is false. The official world’s smallest living horse Thumbelina is that height. Meanwhile most other small horse breeds are 28-38 inches tall which is a huge disparity compared to Ham’s claim. Thumbelina is also a Miniature Horse and not a Falabella. She is that short due to severe dwarfism. An actual genetic disorder, not just being bred that small through selective breeding. Mr. Ham does not have horse sense. Thanks Threnody! I hadn’t thought to check on just how small miniature horses actually were. As I always say, if a creationist tells you the sky is blue, go check for yourself!